Heading home on the row boat in Exploits Harbour. It’s remarkably difficult to row and take pictures simultaneously. 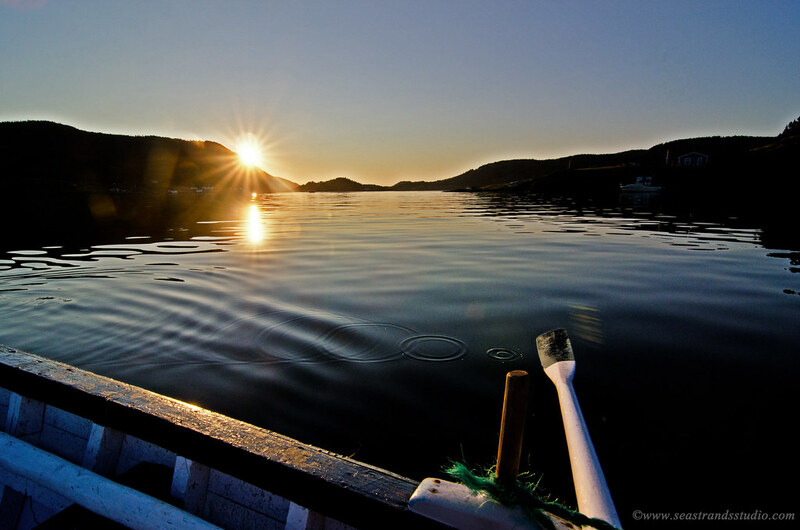 I woke up this morning in the middle of a dream, in which I was trying to find a boat to take me to Exploits Islands. I could read all sorts of wonderful symbolism, about stress and escaping from it, into this mental meandering. It probably has something to do with Exploits being a place without the complications of daily life in a city. Perhaps it’s also to do with the fact that I’ve been thinking about the roofing job we’re getting done there and delighting in having found a competent contractor who likes working on this remote island devoid of electricity. Or maybe I’m just really tired and want to go to that place that sometimes feels more like home than the home of my every day. Whatever the case, I woke up as the phone was ringing to advise me that the boat was on its way and I’d be on the island in a matter of an hour or so. Only the phone ringing in my dream was the alarm clock sounding off on my reality to tell me that it was 6:30.